Today we have a guest post (or guest review rather) by Christiana, who is studying linguistics over at the University of Alabama. Christiana’s learning Japanese, Korean, Arabic and Thai (fun combination! :)) and is sharing her experience today with the Nakama 1 Third Edition textbook for Japanese. The language that thousands of us want to learn for reasons such as work, fun, or watching anime without subtitles (me). No matter the reason, it’s a great language to learn in all its complex glory. When I began learning Japanese a year ago, I watched a bunch of PuniPuni videos on YouTube (if you don’t know about that channel or website, click here), which gave me a basic understanding of sentence structure and verbology. There are so many PuniPuni videos and others like it online, so I thought it would be easy to learn Japanese because (as it seemed at the time) there was always a video which answered every burning question I asked. I felt as though everything I needed was on my computer screen but I wasn’t asking more interesting and in-depth questions. I wasn’t in the big leagues of linguistics by asking such small, childish questions like those above (although they did help with the very beginning of this journey). I had no idea about more complex sentences and phrases, idioms, etc., until I cracked open the Nakama 1 textbook. The internet helped a lot, and by the time I bought the book (along with its workbook), I already knew basic vocabulary, hiragana, and some kanji, but I never imagined how much more I would know and how detailed the answers to my newfound questions would be by the end of the textbook. I’m going to start off with the cons of the textbook and workbook because it isn’t really that bad. So, the biggest mark-off I sensed out of all 518 pages’ worth of lessons is that in any given chapter, there can be up to 89 vocabulary words (chapter 10), or at least that’s the most that I counted. Honestly, I’m all for heaps of vocabulary, but at the same time I have to admit that 89 vocabulary words is a bit over the top for just one chapter. However, the vocabulary is indeed relevant (family members, body parts, useful adjectives, etc. ), and I can guarantee you will need them all if you plan on being adept in the Japanese language and adapting to everyday life and everyday conversations. Another con is the literal book itself. It’s too big, or rather it has an abundance of content within it. Did I mention there are 518 pages? That’s more pages than 3 individual Harry Potter books which have less than 320 pages each (UK version). My point is that there is so much content and so much detailed information within each of the 12 chapters that it seems very overwhelming and you might feel like giving up because the textbook doesn’t seem like it is ever going to end. The important thing to remember here is to pace yourself. If you don’t, you will burn out, and I’m sure other language learners, myself included, can tell you horror stories about loss of motivation while studying and learning and how pacing your learning and taking breaks and focusing on 1 lesson or chapter at a time will be best. But if you really think about it – this con is also a pro, isn’t it? The con above is a pro as well due to the amount of content, which means that you can keep yourself busy and won’t necessarily need to buy another textbook or another website subscription for weeks, months, or even a year. Perhaps the best asset to this textbook is its articulacy in issuing instruction. The kanji or Chinese-adopted characters are introduced in every chapter. 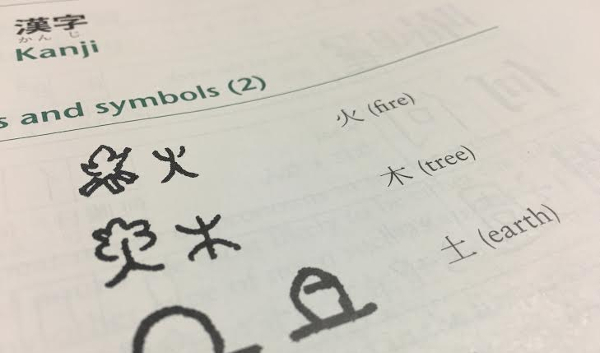 Each chapter uses the kanji in easy-to-understand ways and even draws out pictures to show where the symbols came from. Each kanji is hand-written/ hand-printed stroke by stroke, which is important when writing. 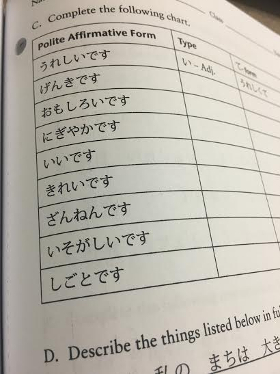 Before learning about stroke order, I had Japanese friends laugh and correct me when I wrote kanji in front of them because as they said, “That’s just how we do it”. Conjugation is super important in this language due to certain verb or adjective endings and prefixes and suffixes for words, names, and titles having certain meanings and extensions of expressions. The book explains the name suffixes -san, -kun, and -chan well, and makes a note of when and how these should be used so that you don’t anger someone of authority such as a teacher, elder, etc. As for verb and adjective conjugation, there are MANY detailed charts and other visuals that explain exactly how to conjugate them depending on the situation, the person or people you are in a conversation with, etc. When I say the authors thought of everything beginners and intermediate learners should really know, I mean exactly that. Not to mention the legitimate cultural examples that go along with each chapter. And last but not least is Nakama 1’s abundance of dialogues and real-world examples provided within a chapter when they’re needed. Certain lessons teach you how to interact with your environment and speak to natives in Japan when you need to ask for directions, order food at a restaurant, buy coffee at a café, or ask for help finding and buying clothes and accessories for a friend or family member in a department store. Before practicing with a partner (or even by yourself), you can study how the situation can be handled. A good example is asking for directions to a certain building like a hospital or a bank. There is a full dialogue in the textbook utilizing grammar points outlined within the same chapter. It gives an example of what can happen and how you can handle taking directions from a native speaker. In the workbook, you will find pages adjacent to the textbook chapters where you can fill in the blanks of a conversation within a scenario such as ordering food or asking the price of your meal, or the exercise will prompt you to play out the scene with a partner. Either way, these dialogues are some serious teaching and learning techniques that I can truly say make this textbook-workbook duo one of the best on the market. The pricing isn’t that bad. Sure, I ended up paying $211.13 for my textbook and workbook, but it was only due to the fact that I had to get them from the university bookstore, and being the lazy person that I was, I waited until actually starting classes to complain about how I could have saved at least $55 on the textbook and student activity manual (workbook) if I had bought it from an online store like Amazon, Barnes & Noble, eBay, etc. But I had no other choice (plus my professor took off points from grades if we forgot one of the books at home, even on the very first day of class). I barely stepped foot in the classroom and my grade was already dropping. So I bought the overpriced, over-expensive, exorbitant books at the bookstore. But lucky for you, I researched some prices that are a little bit better than that, and they don’t go over $200. 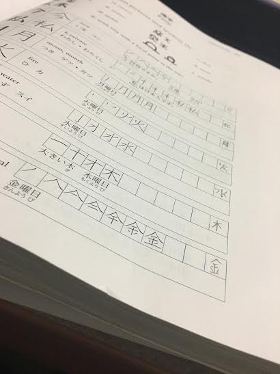 Your Nakama experience would be a lot better if you obtained the workbook to be able to practice along with the textbook’s lessons, but it is not a necessity. You don’t have to buy it (the workbook). And of course if money is an issue, then you can always buy the workbook later. It’s up to you. Each of the 12 chapters are divided based on their overall topics (Greetings and Introductions, Daily Routines, Restaurants and Invitations, My Family, Seasons and Weather, etc. ), so based on these, which are relevant to a beginning learner, there are vocabulary words, grammar points, and cultural lessons tailor-made to fit each individual chapter in which they preside. I can’t tell you everything. I want you to experience it for yourself, however I will say that you can expect to speak Japanese at an intermediate level with much confidence in your comprehension abilities. In short, this book is basically a beginner-intermediate learner’s HOLY BOOK OF JAPANESE LEARNING. 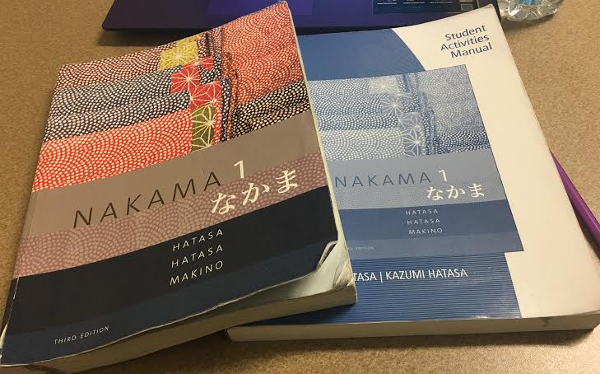 If you’re learning Japanese or plan on learning Japanese sometime in the future, Nakama 1 Third Edition is what I personally recommend to you. 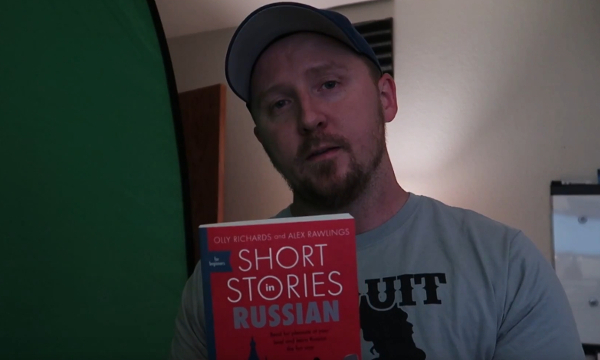 There are some negative points throughout the book such as the overwhelming amount of vocabulary words and overwhelming amount of content within the textbook in general, and it can definitely discourage you from learning the language as a whole for a while if you don’t pace yourself enough. But with easy-to-follow instructions, challenging textbook exercises, challenging workbook exercises, thorough explanations, and detailed visuals with hand-printed writing examples and templates for hiragana, katakana, and kanji, what else could a novice learner ask for in a learning tool? The positive aspects definitely outweigh the negative. At the very least, you will benefit from the pictorials and easy-to-grasp concepts, so do yourself a favor and buy the books.